I found AIT (Advanced Individual Training) to be a pleasant improvement over BCT (Basic Combat Training). Although we still had to endure physical training from time to time, most of our time was spent in the classroom and field, learning about 3 different radar systems. In addition, Ft. Sill, Oklahoma had lots of magnificent trees and lawns, a huge improvement over the dead, dry landscape of Ft. Bliss, Texas. I soon found myself engrossed in the radar classes to a point where I was earning high marks and the privilege of tutoring other students. I guess that I had decided to make the best of the time I would be in the military. One thing I did find rather odd was the fact that about ½ of our class was composed of Marines. Not surprisingly, this created fierce rivalries and occasional altercations. Generally though, the troops got along and directed their competitive energy in legitimate directions such as track meets and target rifle matches at the indoor rifle range down the street. We trained on 3 different types of radar systems. The AN/MPQ-10 radar tracked artillery rounds. The AN/MPQ-4 tracked mortar rounds and the AN/TPS-25 was strictly for ground surveillance. The object of the artillery tracking radars was to detect a projectile in flight and then extrapolate the trajectory back to the source, thus locating the enemy gun position. The ground surveillance radar was solely for detecting movement of any type on the ground and providing the coordinates of the target to TOC (Tactical Operations Center). We were given a fair amount of practice in the field with all three types. All of this was crammed into 8 weeks of training. I made a couple of new friends during the radar training course and by coincidence, all 3 of us ended up in the same outfit in Germany. Mark had a keen sense of wit mixed with a generous amount of sarcasm and these traits certainly helped all of us keep our sense of humor during the not-so-fun moments of being in the Army. Rick was an Army brat and was street-wise enough to teach us the finer points of dealing with local economy. Graduation brought satisfaction that training was pretty much over, or so I thought. 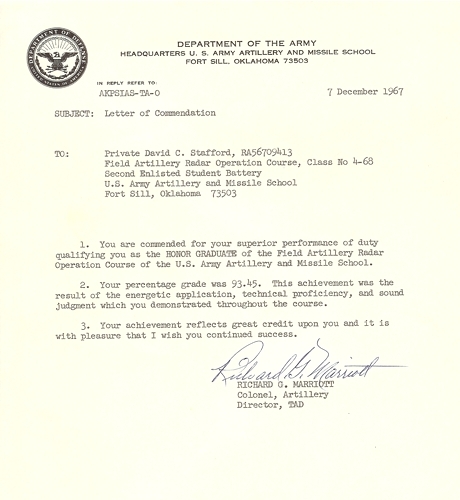 Right after graduation ceremonies, our school Commandant approached me and said he was recommending me for the NCO Academy. This really caught me off guard, so I told him I would have to think about it. Initially, the idea of being promoted from Private E-2 to Sergeant E-5 after only 90 days of additional training seemed very attractive. But then, I could not ignore the responsibilities that would come with the rank, plus I’m sure it greatly increased my chances of going to Vietnam. I tried to imagine myself as the section chief of a radar outfit in a war zone with zero time of practical experience. Decision: Forget it – I’ll work my up through the ranks in the traditional manner while gaining valuable, actual experience. The Commandant was very disappointed in my decision, but to this day I believe I made the correct choice (I did eventually make E-5 rank during my 12 month tour in Vietnam). At least now I have an official MOS (Military Occupational Specialty), 17B20 Field Artillery Radar Operator. With Christmas near everyone sure wanted to be home for the holidays. Within days I had my orders for Germany and they allowed time for Christmas leave. I breathed a sigh of relief. I began wondering what Europe would be like.